If you’re in the market for an RV, you should be ready for adventure — and ready for some serious conversations about your finances. Buying an RV is a huge decision that shouldn’t be made lightly. Thankfully, doing a little bit of prep work can save you in the long run from making a purchase you’ll come to regret. 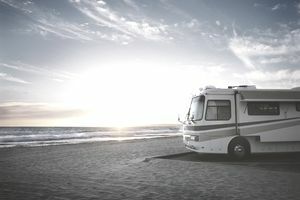 The interest rate you’ll be able to secure on your RV loan will depend on your current income, your financial history, and the amount of money you’re able to pay as a downpayment. Before you shop for RVs, take a realistic look at your finances. Once you know you’re going to be able to afford an RV, shop around for an interest rate before you go RV shopping so you’ll know what you can expect to pay throughout the lifetime of your loan. How Much RV Can You Afford? Financially, buying an RV combines all of the worst aspects of buying a car and of buying a home. Like a car, an RV depreciates quickly: You can expect to lose about 20% the moment you drive it off the lot, and 5% a year after that, which is a big amount of money considering how much many RVs cost (more in the range you’d associate with small homes than with vehicles). As you’re figuring out the sticker price you can afford, you also need to take into account your ability to pay back the loan on the RV before it depreciates. Really, an RV’s sticker price is only the beginning. Of course, you need to have an idea of what range of RVs you should be considering, but you also need to realize that there are many other costs that go into affording an RV. To get an idea of what sticker price you should be aiming for, work backward. First, pick a reasonable time loan period (10-15 years is standard) and multiply that number by 12. If you’re aiming to pay back your loan in 10 years, that means 120 — 15 years means 180. Next, figure out how much you’re reasonably able to pay per month. This amount will depend on a lot of factors, including your income and current other debts. For this example, let’s say you can afford $1,500 per month. Next, multiply your first number by your monthly figure. In this example, a 10-year loan gives us 120 x 1,500 = 180,000 and a 15-year loan gives us 180 x 1,500 = 270,000. You might think that this number gives you the sticker price you can afford, but that would be a big oversimplification. First, you need to account for maintenance. If you’re on the road full-time, you can expect to add about $20,000 in costs per year to your RV’s sticker price. If you’re on the road less frequently, you can probably keep your costs around $1,000. Deduct this amount from the amount you can afford. For our 10-year and 15-year loan examples, let’s assume we’re on the road for the summer each year and deduct $5,000 in maintenance costs from our ideal sticker price. That brings our ideal sticker price down to 130,000 for the 10-year loan and 195,000 for the 15-year loan. Notice that I didn’t put any dollar signs yet, because we’re definitely not done doing the math. In addition to maintenance, you’ll also need to account for the downpayment you’ll need and the interest you will be paying on the loan. At the minimum, you should aim to put down 20% on an RV — so if you don’t have $26,000 saved, you have no business purchasing a $130,000 RV. So let’s continue our above example but assume we only have $15,000 to put as a downpayment on an RV. At most, we should be looking for a $75,000 RV, even if we can “afford” $130,000 of RV — because if you can’t afford the downpayment, you’re going to go underwater on your loan the moment you drive your RV off of the lot, and that’s never a good idea. Seriously, you really don’t want to owe more on your RV than it is worth. If your RV is ever totaled or stolen, you will want to avoid having to pay back a loan on an RV that you don’t even possess anymore. What About The Future Resale Value? When considering how much RV you can afford, you should never speculate about how much you can expect to get for it when you sell it. Why? Well, for one, if you own the RV for more than 17 years, it will have pretty much zero resale value. For another, there isn’t exactly a booming used RV market, and you’ll never really know how much money you’ll get for it or how long it will take you to sell. Play it safe and only buy something you can afford forever.